Thoughts on Nike's new ad? Thread: Thoughts on Nike's new ad? People are losing their minds and must have short term memories because Nike has always been the type of company to bounce on the backs of issues like this. They stuck with Tiger and Kobe through all their crap and had some kind of ad that ran in the 90's that people lost it over. I think it was a Barkley commercial. I think it's frustrating how so many companies shoehorn politics into their products nowadays. It's so obvious what's going on here. 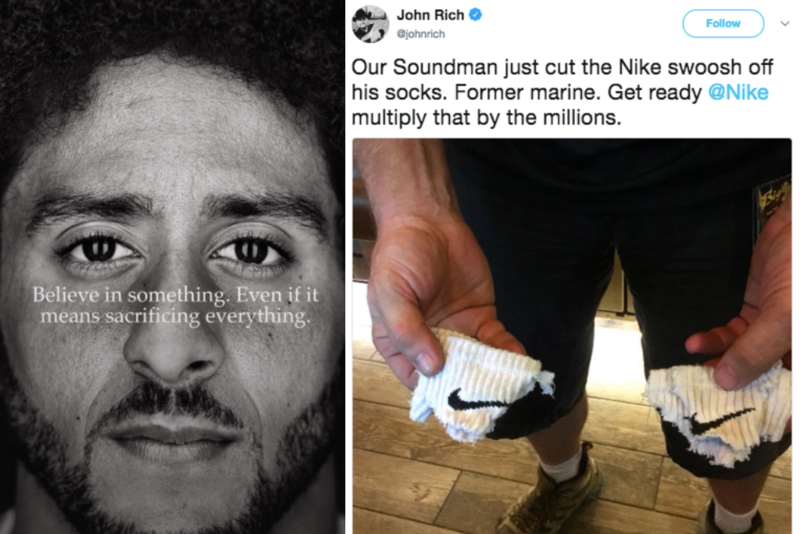 Nike has quite a large African American following, so why not dupe them (and BLM followers of other races) into buying a pair of shoes with a pro-BLM message? But to me there's a line to draw. Cutting up a pair of socks on social media is hilarious and ridiculous. At the end of the day it's just a shoe company trying to capitalise on controversy. They should stop being such numbskulls by adding fuel to the fire and if they don't like it... just stop buying? Politics is more of a "mainstream entertainment" than anything today. Like I know when I was younger, even just 18 or so, no one my age was talking about the president. Now you have 15 year olds getting into heated debates about the dumbest things. "Oh you like so and so you are a racist!" or "you only say that cause you are *enter any political group here*!" Most people who argue over politics hardly even understand them. Then you have businesses like this who further push politics onto children (teens) who don't even know what they want to do with their lives trying to dictate how a country should be ran. It is all a mess. Honestly, I don't see anything wrong in the ad, or am I missing something here. Is it the model? Is he also an athlete? The quote? It's not that bad and politically correct (unbiased and fair) at some point. If you really want to achieve something so badly, you should be willing to sacrifice mostly everything to achieve success. Right?